We have MoveOn.org in support of Occupy Wall Street. Well what exactly do they do now? Move On or Occupy? Occupy or Move On? Just for fun let’s look at these two organizations thinking M&A? Which law firm would represent them? Think IPO. Which Wall Street firm would they choose? I tried to figure out which of these movements or occupations is best to follow. Honestly, I’m not sure. They both have valid arguments and serious flaws, like how they hurt small business. A merger between MoveOn and Occupy could be a lesson to Microsoft and Yahoo, like oil and water. If you go on the Move On website there are too many Move this and that movements to follow. If you try to understand the Occupy this city, that State or country’s position, well… it gives one pause. So we’re at a standstill. So to get this impasse, one would assume most activists would prefer movement to being at a standstill. Going nowhere is boring. Rhetorically speaking one could say both MoveOn and Occupy Wall Street are consistently incongruous and therefore not helpful? What one can be sure of is whether they are moving on or standing still, neither position is creating jobs. “Back in the day sonny” he croaks, from his Easy Boy recliner, “when all we knew was black and white, if we needed to make a point, we did it in a demonstrative, albeit sometimes incoherent fashion.” Think Woodstock. Joe Cocker’s With a Little Help from My Friends was a classic Joe Biden sound bite. Incoherent! Just kidding Joe!?? No need to insult anyone? So one can’t help but ask, “Who’s Got Wood?” Woodstock? A cause expounding peace and love that resounded worldwide over a single weekend or Occupy Wall Street that makes us wish Jimmy Hendrix was still singing “Hey Joe” to Joe and Joe was heading for Mexico. You decide. 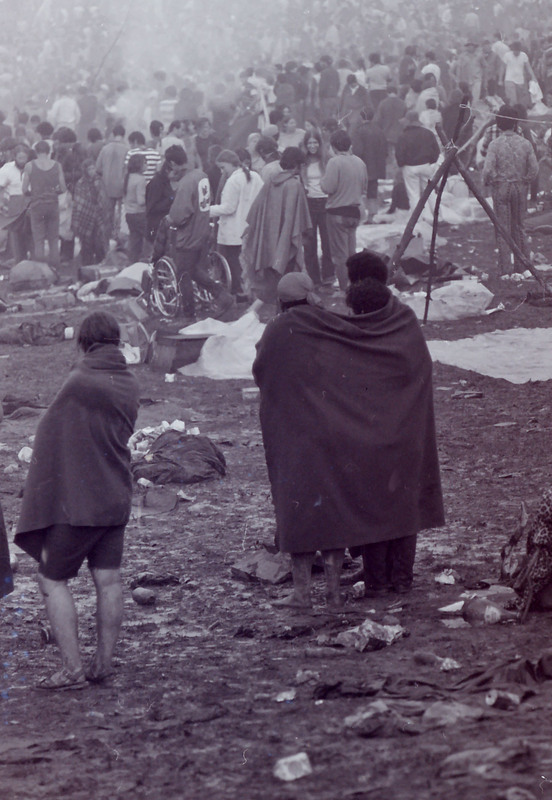 Woodstock. 1969. Made into a movie. Not a Michael Moore movie. A movie that will live on in history. Why? Almost all of these people now have good paying jobs. Most of them pay taxes. Yes, some are dead, surprisingly fewer than one would think, like artist Keith Richards, the wrinkly rocker from the Rolling Stones. OK, he wasn’t even there and surprisingly, he’s not dead. These peace loving folks went home after a long weekend of demonstration and made a difference for America. Most folks here in America and around the world applaud Occupy Wall Street for making a statement. We hear you. We hear all of you. You can make a difference, just not standing still. Not anymore. Now you are hurting the same people you should be trying to help, job creators. Small business people. Feel free to agree, disagree or simply ignore me. Express “yourself.” Leave your comments, share or spread the word with Stumble Upon button below. Subscribe or come back often to visit. 3 Responses to Got Wood? The OWS movement was originally about the disproportionate level of prosperity Wall Street can make by borrowing from the Fed then getting paid interest on retained reserves. That makes money out of thin air, and it doesn’t do anything to benefit the country except enriching those that are participating in the practice. Personally, I think MoveOn.Org is just striving for relevance, so they’re trying to ride OWS’ coattails. In my opinion, MoveOn.org has an agenda and that is to Move the country Onto a more socialistic form of government and to diminish the strength of the United States around the world. MoveOn.org, led by Billionaire financier George Soros is not a pro-democracy group. As a matter of fact, everything George Soros touches, he seeks to profit and destroy as he did in the United Kingdom cornering their currency, bringing that country to brink of financial disaster, until the Royal Family stepped in and bailed the country out. Then there was the Soviet Union/Russia transition, Soros yet again tried to corner the oil contracts in Russia, during the transition to Russia. Vladmir Putin saw this and threw him out of the country. Now George Soros has placed his roots in America, profiting handsomely with the help of Barack Hussein Obama. As Obama continues to divide America playing the Class Warfare card and being the Great Divider, George Soros continues to add to his wealth taking advantage of the government handouts of TARP and the many Stimulous programs concocted by Obama. I believe that Most Americans are getting disgusted at what they see with this “Occupy” movement and are starting to understand who the players are behind the scenes. The Great Divider Occupying the White House was a Community Organizer by trade. He’s done a masterful job in organizing this so-called democratic movement (although America is still a Constitutional Republic), detracting from his own FAILED economic and foreign policy record. Obama now likes to paint himself as a Washington DC outsider and enjoys ripping into Wall Street. Yet much of his cabinet and advisors surrounding him are from – guess where? Wall Street! During recent campaign stops to raise money for his re-election, where has Obama held his $30,000 per plate fund raisers? guess where? Wall Street! Sadly, the media in this country does not hold Barack Obama accountable for his actions. They are somehow enamored with this man; is it because of the color of his skin or due to the media espousing the same radical political ideology or do they see Obama as Pres. Kennedy or is it guilt? You do have to marvel at the timely nature of the Occupy movement. It has taken major political issues off the front page, such as: Solydra Failure, Fast and Furious, Libya, another $4 billion in “Green” company Taxpayer Funded Loan Guarantees and Obama’s continued failed economic schemes such as Stimulous 4, I mean the American Jobs Act.